Recently, I was sent some French wines to try and set the challenge of pairing them with food. You may remember that I did a similar challenge before and that I confessed to beng rather rubbish when it comes to knowing a good wine! Not wanting this to hold me back, I accepted the challenge because who doesn’t love a good French wine?! 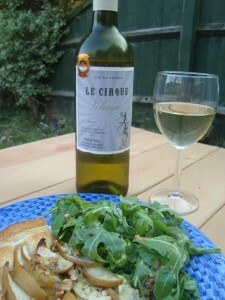 The one that I chose to pair with my food is called Le Cirque, which is a Chardonnay from South West France. It is pale in colour and for once I could pick out the different ‘flavours’ coming through – and very nice they were too! I could really taste the warm ginger and despite being a dry wine, there was a hint of sweetness, perhaps from the honey and floral notes. With the warm weather at the moment, I am favouring quick and easy dishes that I can throw together in a few minutes and enjoy out in the garden – more time for enjoying the lovely wine! 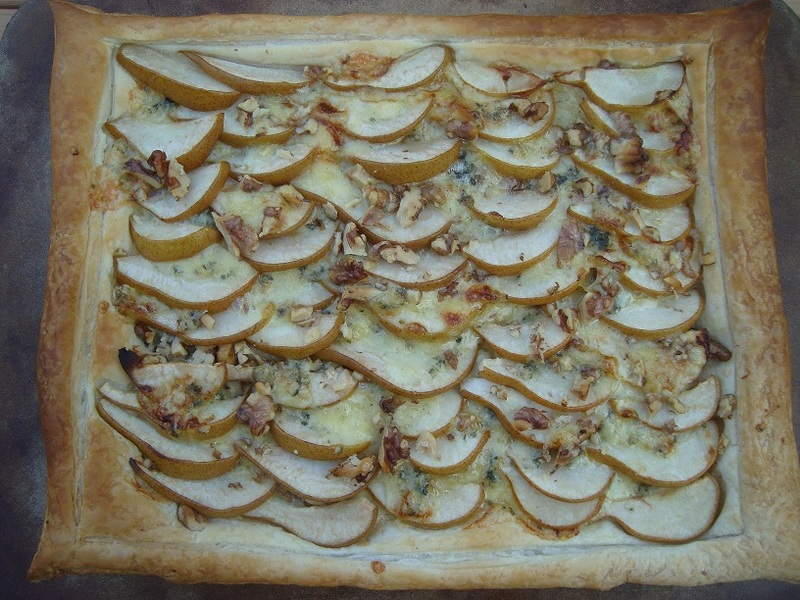 So I decided to make a stilton, pear and walnut tart, which I served with a rocket salad and a honey, mustard and walnut dressing. Stilton, pear and walnut are a classic combination and one that makes me think of France. The honey in the salad dressing brings out the sweetness of the wine, whilst the peppery rocket cuts through that sweetness to stop it from becoming too sickly. 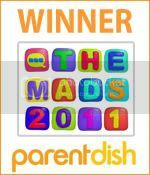 A thoroughly enjoyable meal! Whilst it is perfectly possible, although time-consuming, to make your own puff pastry, I almost always use shop bought. There is no way that I am going to faff around with making puff pastry in this heat! 2. Roll out the pastry into a rectangle approximately 35cm by 20cm, trim off the edges and place on a baking tray. With a sharp knife, score an inner rectangle about 1/2 inch from the edge. Don’t cut all the way through the pastry, you want to cut through the top layers so the edge will rise to form a ‘lip’, with the filling in the middle. 3. Crumble half the stilton over the inner rectangle. Roughly chop the walnut pieces and sprinkle half over the stilton. 4. Cut the pears into quarters lengthways, remove the cores then thinly slice. Arrange the slices over the stilton and walnuts. 5. Sprinkle the remaining stilton and walnuts over the pear slices to give an even coating. 6. Bake in the centre of the preheated oven for 20-25 minutes until the pastry is golden and the pears are cooked through. 7. Meanwhile, make the salad dressing. Crush the walnut pieces either with a pestle and mortar or in a food processor. Then mix them with all the other ingredients. 8. 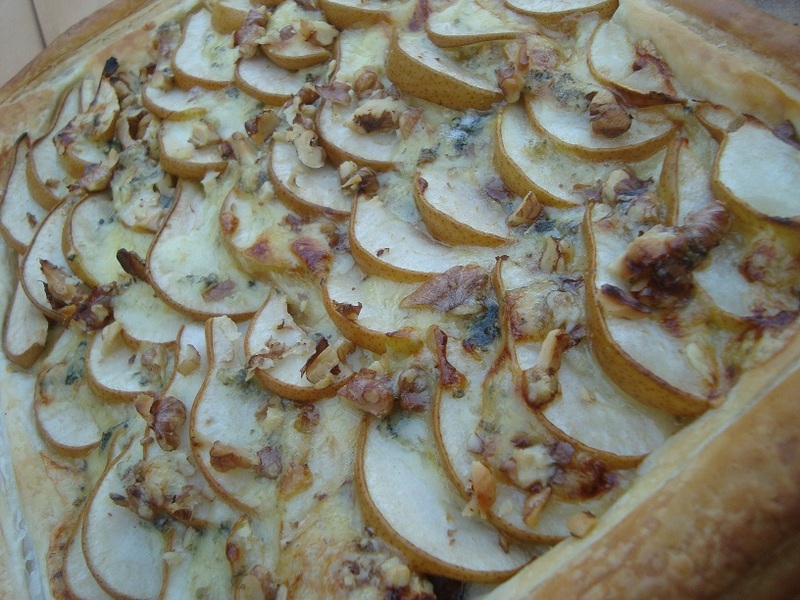 Toss the rocket in the dressing, pile onto a plate and serve with a slice of the warm stilton, pear and walnut tart. It’s even better if you can sit outside in the sunshine with it! Thanks to Sopexa for sending the wine for me to try. I must point out that we both encourage responsible drinking, please visit www.drinkaware.couk for more details. I am drooling looking at that and I’ve already eaten stilton tonight in a cheese sauce with pasta! I prefer red wine to white but chardonnay sounds like a good choice for this tart, I can almost taste it now! I’d like to add that I would have married a chilled Pouilly Fumé with this tart rather than a dry Chardonnay. The Pouilly fumé has notes of pear (like those peardrop sweets), vanilla & grilled walnut. (Been living in France for 12 years & regularly buy Pouilly as it’s the region where my father-in-law lives). But being a veggie, I have never tasted a cheese I don’t like and I do particularly like the blue cheese, walnut, balsamic combo.